By default, Mavericks will install the Java JDK program when it needs to run Java for an application. We have found this is the cause of many problems for our print driver installation as well as other Java based applications. If you are a Java developer, you may need to re-install any JDK or Java components required by your software after this process. We have tested the below steps and found this is the most efficient way to correct this problem. You may need the administrator password for any installation processes so have that available. In the Finder toolbar, click Go and open your Computer. It may be easier to find the required components by showing the icons in List mode. Open the Library folder and Trash the Java folder with all items inside. Open the Internet Plugins folder and trash the Java Plugin. Open the System Folder, open the Library folder and Trash the Java Folder with all items inside. Check to see if any Sfax pieces are installed and if they are, Trash these as well. These may be in your Utilities or Applications folders. Restart your computer. Once rebooted, Click the Apple Icon and open your system preferences. Double click the Java Icon at the bottom. It should inform you that Java cannot be opened because it is not available. You must be accessing the website from the machine you need to update, as the site checks the operating system you are connecting with. A box should pop up asking you to Double-click on the icon to install. During these processes you may need to enter in the Administrator Password multiple times. Have the password readily available. 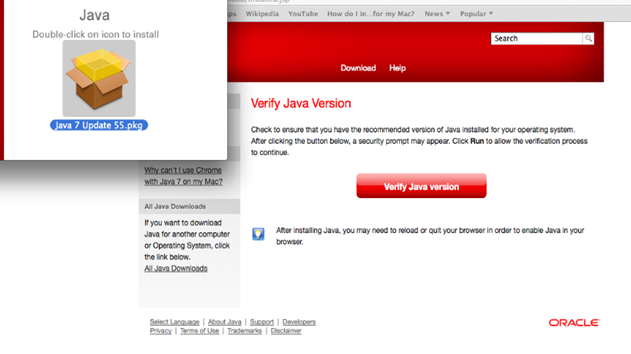 Once the install is complete, another window will ask you to verify your installation of Java. Close all of the opened windows. Download and start the installation of the “JavaForOSX2013-05.dmg” file from the Apple. Please note, the filename may be newer if Apple has released an updated version of the install. You can find assistance for installing the driver here. There have been instances where users have had to Trash and re-install the application in order for it to properly install the Sfax Printer.